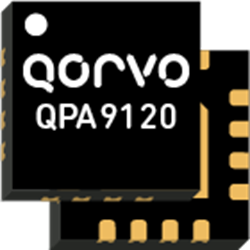 Qorvo’s new QPA9120 is a high gain, high linearity driver amplifier able to operate over the 1.8 to 5.0 GHz frequency range. This amplifier features exceptional performance with 36 dBm output 3rd order intercept (OIP3) power and 22 dBm output 1dB compression (OP1dB) power while consuming less than 100 mA DC current with single 5V supply. The QPA9120 incorporates on-chip features with fast DC power shutdown, extremely configurable device DC operation current, and is internally matched. The QPA9120 is optimized for use as a pre-driver amplifier for wireless infrastructure where high linearity, medium RF power with efficient DC power operation are required. The device is also an excellent choice for 5G dense-array m-MIMO radio applications. Download the full datasheet for more information on the QPA9120 driver amplifier.